Not just another pretty face in Puerto Peñasco. 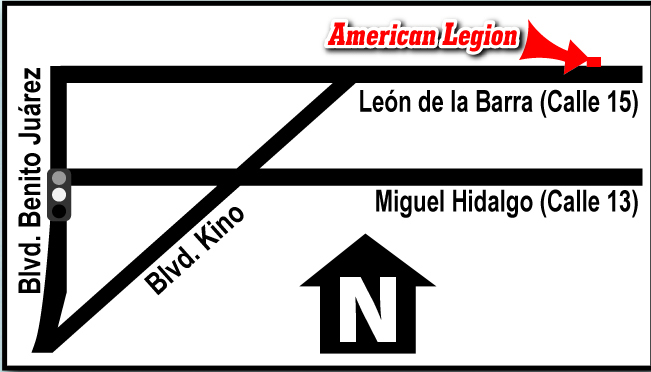 Located on Calle 15, between Benito Juarez and Josefa Ortiz, the American Legion is made up of former United States veterans and associates. It is one of 18 organizations in the country of Mexico. The American Legion Post MX-15 has old people, young people and in-between, but we all have a common goal to feed the elderly that can’t make it to various organizations around town. We get donations from our members and their friends who have heard about our service, and we deliver to about 15 families all over Peñasco on Wednesdays. We provide a variety of foods, depending upon what is available each week and could include beans, rice, peanut butter, bread, tortillas, boxes of powdered milk and sometimes vegetables. And, of course, a few sweets for the kiddies. When knocking on one door an elderly lady put her hands together and asked “coffee, coffee por favor”. We didn’t have any coffee that week so our delivery person went to the store and got her a jar of instant coffee. Our food program is run by Dion, who has a heard of gold, and all the kids just love him. You don’t have to be a veteran to visit our club, and you can become an Associate for $30.00 USD a year. We welcome all who enter our doorway and everyone is treated as a friend. We have refreshments such as beer, wine and mixed drinks at a very low cost. Beer is $1.75 and mixed drinks are from $2.25 to $3.50. Dinners are served on Mondays and Wednesdays and lunches are served on Tuesday, Thursdays and Fridays. For dinners we have something different each time. Most will be like your mother used to cook, meatloaf, liver and onions, spaghetti with salad and garlic roast, homemade soups and more. Our club manager Ardi Harris is an excellent cook and you won’t be disappointed. And at such a bargain ($4- $6 USD)!! For lunches we have a huge sandwich and chips and soup for $40 pesos. At todays exchange rate, that’s about $3.00 dlls. Come down and see for yourselves. Need directions? Call us at 388-8841 or (602) 539-0381 (Magic Jack line). See this is what i like about veterans….keep the focus….for the clubs in the states are different,,,they have forgotten to care for the elderly…do nothing but get drunk and ruin the image of the american patriot. It matter not where you are, what matters is that you are caring for other human beings. I love every single one of you and i will visit you soon. Let me know what you need,,,i will be glad to load up my excursion and brings stuff down there….ain’t nothing but a thing….I hear that coffee is in high demand….I have a group of motorcycle riders that love to help the not so lucky. FYI the American Legion has moved from this location they have a new beautiful building just north of the Pink Caddilac… We wish them all the best.